Surging mobile usage worldwide - According to a leading market research firm eMarketer, it is anticipated to have about 2.97 billion smartphone users in the world by 2017, comprising 91% of all internet users. Simply put, more than 50% traffic is anticipated to come from mobile devices including phones and tablets. 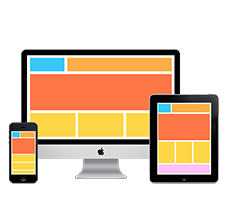 One website for all devices - With responsive site, you need not to invest in a separate mobile-friendly website. Responsive design is a one site for all device. So, you will avoid the hassles of maintaining multiple sites and domains. This also means that you have only one site to apply all your marketing efforts for. Time-efficient and cost-effective solution -With responsive site, you can considerably reduce the development time and cost. You wonï¿½t need to invest time and resources for the development of both desktop and mobile websites. Google likes it - Yes, Google webmaster team has exclusively recommended to make mobile-friendly sites saying it will help get higher ranking for both mobile and desktop search results. In its official blog, they have said that sites that aren not mobile friendly may compromise on SERP rankings. So, if you want a business website which is both search engine friendly and mobile friendly, responsive web design is the answer. With a responsive website design, you will provide search engine crawlers with a single version of your website for both mobile and desktop visitors which will make the search engine spiders job easier and help them better understand your site content! Yet, What is exactly Responsive Web Design? Well, if you are still are not clear what is Responsive web design (RWD) all about, let we clear it first before discussing our expertise into the niche. A responsive design is a cross-browser and cross-platform compatible UI design that can adjust itself to best fit the screen size and browser it is being accessed from. It is an advance technology that allows web designers to code the style sheets of your website such that the layout auto-adjust to the width of the browser it is viewed on. Responsive web design thrives on a clear goal to deliver most excellent user experience on different devices with different screen sizes and resolutions. Simply put, whether your targeted niche access your site from a desktop browser, notebook, smartphone or tablet, the responsive web design will dynamically adjust the content including images to adapt the particular screen size and resolution in the best manner feasible. At Axis Technolabs, we build responsive websites that help our clients from all across the globe prepare for the future of the web. Not just we can create a brand new responsive web design for you, but we can also transform your existing desktop site into responsive one. As a leader in the web development services provider niche in India, we are backed with world-class resources and latest technology to make your responsive website more productive and appealing. Here are some key traits of our responsive web design service that give us an edge over market competitors. We ensure a bespoke design and development service to every project we undertake. Instead of just transforming the desktop version into the mobile version, we focus on every element of your site design to bring it in line with your business requirements. We help redesign your existing website to make it mobile-friendly. And certainly, we specialize in creating a responsive website from scratch. Our web designers are skilled and experienced working with latest programming languages and tools such as CSS3, HTML5, WordPress, Java and PHP. Every responsive site we create is SEO-friendly that helps you boost your online business revenues! Undisputedly responsive websites are the future of the web. Want to know more about our responsive web design service? Get in touch with our experts today!